He has moved the case of Rashid Rauf, a Briton, from an anti-terrorism court to a regular court, where he faces lesser charges such as forgery. Pakistan has presented Mr Rauf as one of the ringleaders behind the alleged plan to blow up flights out of London. The British authorities say they foiled it with Pakistan's help in August. They say proceedings against suspects arrested in Britain will go ahead. The arrest of Rashid Rauf in Pakistan triggered arrests in the United Kingdom of a number of suspects allegedly plotting to blow up transatlantic flights. The Pakistani authorities described him as a key figure. But an anti-terrorism court in Rawalpindi found no evidence that he had been involved in terrorist activities or that he belonged to a terrorist organisation. As well as forgery charges, Mr Rauf has also been charged with carrying explosives. But his lawyer says police evidence amounts only to bottles of hydrogen peroxide found in his possession. Hydrogen peroxide is a disinfectant that can be used for bomb-making if other chemicals are added. The BBC's Barbara Plett in Islamabad says the judge's decision has reinforced the already widespread scepticism there about the airliner plot. Several commentators said the threat was deliberately exaggerated to bolster the anti-terror credentials of Pakistani President Pervez Musharraf and that it helped to demonise British Muslims of Pakistani origin. The Crown Prosecution Service in the UK said the dropping of charges against Mr Rauf in Pakistan would "make no difference" to the case against the men charged in Britain. In August, the British government requested the extradition of Mr Rauf, a Briton of Pakistani origin who returned to Pakistan four years ago, in connection with a 2002 murder. Scotland Yard declined to discuss which murder case the request related to. The government in Pakistan, which has no extradition treaty with the UK, said it was considering the request. Rashid Rauf was arrested in Pakistan earlier that month over the alleged plot to blow up US-bound aircraft, Pakistan's foreign ministry said. He has been described by Pakistan's government as a "key person" in the "suspected conspiracy". 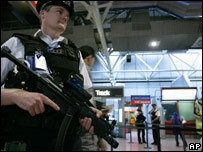 The August arrests led to increased airport security around the world, causing major disruption. Passengers on many flights were forbidden to take liquids aboard aircraft.